This photo was taken during a game of horseshoes in the 7th Co. HQ compound just before we all boarded Hueys for a big operation. Most of these guys are from CAP 2-7-2, but a few are buddies from other units. 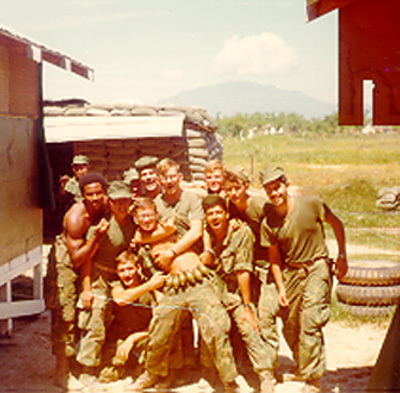 They are (left to right) “Willie” Williams, Greg “Chief” Fragua, Casey Roach (kneeling), two unkown, Marines (in back), Ken Duncan (grabbing Ed McIntyre), Ed McIntyre (with grenades on his belt), Nelson Kilmister (back row), “Dizzy” Diaz, “Huck” Prock, J.J. Arteaga.